It's the 3rd graders' last day! Graduation is tomorrow! I can't believe how fast this year has gone. Kore wa ouendan no taiko desu, yo! Sugoi, ne! I keep trying to convince the guys to let me "play" it, but the boys on the team get very serious and try to explain that it's sacred; unless you are the "drummer" you can't touch it. (no MC Hammer jokes, please.) Even the other guys on the Ouendan team aren't allowed! Hopefully by the beginning of next week I'll have another short video clip of them performing. Right now the kids are all taking their final exams, sannensei graduate Thursday & Saturday (2 different campuses), and with my birthday also scheduled this week, it's a little busy. This picture just kills me. I live in Nishi (west) Isahaya, in an area called "New Town," so the taxis I always see have that written on the side. Apparently there's another area of town (I'm assuming it's near the reclaimed land area - that creature on the side of the taxi looks like one of the 'mudskipper' things that live there) called "Ono"...yes, we actually have a place called "Oh, no!" Last Sunday I made the pilgrimage to Unzen. Well, actually, I didn't get to the top of the mountain, because, once again, I was flying blind here. I hopped on a bus at Isahaya, and thought I bought a ticket for Mt. Unzen (on the map, it's the big mountain/national park on the peninsula that juts off down and to the right of where I am in Isahaya). The bus ride out was amazing - the road wound its way along some cliffs beside the Tachibana Bay, and on my return trip, the sun was setting over the water. I've lived at sea level all my life, but I can't believe how different an ocean looks from so high up! I felt like I was on Cape Breton, N.S. again. Since I wasn't sure where I was going, I got off the bus when the ticket price matched the electronic sign in the front of the bus. Fortunately, I had arrived in the little "resort" town of Unzen, where you go if you want to enjoy some magnificent natural onsens. Unfortunately, it might help to be 'hard of smelling', since the whole place smells like sulfur. Nonetheless, I walked around the boardwalks to see the hot springs, then I hiked a bit in the national park there, which was the first national park in Japan. Afterwards I just HAD to try one of the hard-boiled eggs that the street vendors were selling (when travelling, you must ALWAYS try out the street vendor fare!). (Eggs?!) I'm getting used to "random" "natural" things...I'm finding the Japanese typically revere/celebrate/sell/make stuffed toys of the natural goods of the area. Here, it's eggs - I believe they just stick 'em in the hot springs and 'voila'! Yasui (cheap), too! Only 60 yen - and that even includes a tiny origami salt packet. Mmmm...oishii, yo! Here are a couple of hams at the school marathon we had last week at the big Isahaya athletic park. Ichinensei and ninensei (10th & 11th graders) participated. Girls ran a 3K, and the boys a 10K. I didn't participate officially, but I did run for a bit with groups of students to cheer them on as they passed my station. These girls here are sannensei, and were helping to manage the event (when they weren't clowning around!). Here are some of the cuties and the cards they made for Valentine's Day! Now I'm off to hop a train to Nag to treat myself to a chai tea latte and a movie. Ciao! If you ever find yourself in Japan and desperately need real American food, don't miss this place. In fact, don't miss it if you're ever in Nagasaki! I went here for the SuperBowl - watched the replay - with no commercials - that was strange. However, afterwards Chris lugged over a computer so we could watch the commercials. I had an excellent little pizza, though Chris also offered a steak dinner that night, too. Yum. And I thought I wouldn't have a good pizza again for a couple of years...And, added bonus - who knew that Nagasaki had its very own Ewan McGregor look alike? Make sure to ask to see Chris as Ewan on the magazine cover, and don't leave without saying hi to Mr. Lincoln and Elvis. And a big "shout out" of thanks to my Aunt Barbara and all the Theresians who've been sending postcards! They're great! The kids (and teachers!) are so excited! After my dinner at Mike's, I went to meet the Saza divas (ALTs working just north of Sasebo), Gill (from Scotland) and Meghan (Canada) at an international restaurant around the corner. They were out to dinner with some of their Japanese teaching colleagues. I'm really glad I went! The Japanese teachers were very nice and the man in this photo here played for us. Make sure to check out the video clip of his music (it takes a little bit to edit and to upload - hopefully it'll be up tomorrow). Here's a little plug for a great spot in Sasebo. After school (and the gym!) on Friday I hopped a train up to "Sas Vegas" for a Cheese Night (any cheesy music that is cringe-worthy) at Dazzle Puzzle. I ate dinner at this little place that Gill and I went to the last time I was here. Mike's Mexican - grrrreat! Really cute ambience, and excellent food. It's about as big as your pocket, but well worth the trip. Sorry for the delay on the guy who serenaded us - I promise that later this week. "...and it was THIS big...."
I finally found something in Japan that is actually too BIG for me! 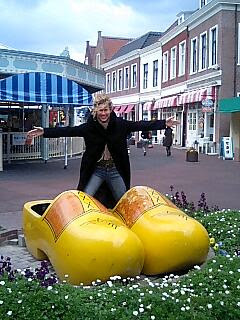 Just goofin around in Huis Ten Bosch on my way home from Sasebo today. Make sure to check back tomorrow to see a video of the guy who serenaded us last night! This is in the garden here at Isahaya High School, Goshoin. You KNOW that I wasn't gettin by this guy without taking advantage of the photo op! Don't forget to click on the title of the next entry to follow the link for the Tenmangu in Dazaifu. This past weekend I was in Fukuoka, and taking the advice of a Fukuokanian (? 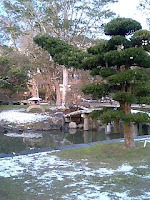 ), I took the short train ride down to visit Dazaifu. The weather had been bleak and cold, but a watery sun winked on for a few moments in the late afternoon, casting about some of its warmth. This site is apparently on the grave for the exiled Michizane Sugawara, who is also known as the god of literature and calligraphy (and knowledge, according one site I saw on him). Maki sensei told me that students wear a charm of this god for "luck" with their studies. I really like how you have to go through several stone "archways" and gate and then down this pathway flanked by plum ("ume") trees and lanterns before you get to the temple/shrine (I have to get someone to tell me the precise differentiation between the two. I think this is the shrine, though). It seems to be the pattern for shrines I've seen all over Japan. Moving through these physical gateways seems to help one move through the inner, intangible ones to prepare the heart and mind for being at the actual shrine itself.